I just received the data last night that will help me summarize current real estate trends in Tallahassee, but first a "small world" story is in order. Michelle and I were at the hospital Tuesday night, waiting for our daughter (Sami) to get out of surgery, when the national CBS Evening News came on. The news story morphed from the NSA Leaker to the fact that Google is being sued for breach of privacy ... and that's where the "small world" bomb dropped. So they start interviewing a guy about how Google monitors our emails and search histories. 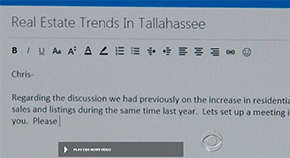 While talking, he's shown filling out an email, and the subject of the email message is "Real Estate Trends In Tallahassee." Somehow, Michelle was able to see that from across the waiting room of the hospital, and it was only on the TV screen for maybe three seconds. So how weird is that?, the national story is about Google, and the gmail in the story is about our market. I suspect he's not the only person interested in current real estate trends in Tallahassee. My new data shows strong gains in year over year sales, increased lot sales, increased new construction, and all the signs of a housing market coming back from the dead. 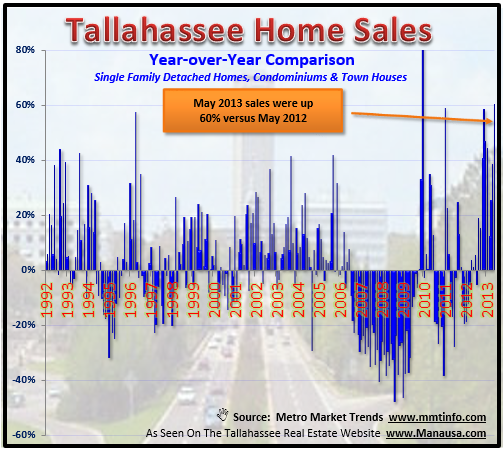 The real estate graph below shows that year over year home sales in Tallahassee were up a whopping 60% in May versus May of last year! But I still have my concerns about all the distressed property for sale in Tallahassee. In fact, I will be updating our Tallahassee Foreclosure Report later this week, and it shows way too many foreclosures for a recovering market. We can see that the average price of existing homes and existing townhomes and condos suggest that buyers understand the backlog of distressed properties. 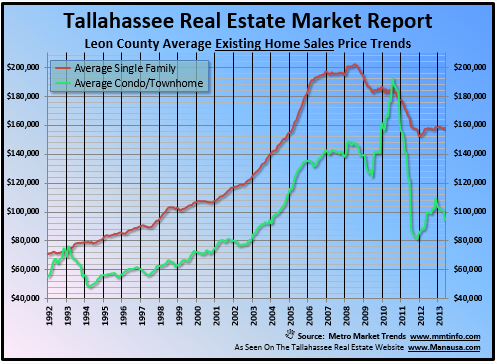 The graph above shows existing home sales in Leon County. It is important to note this includes sales that were not posted in the Tallahassee MLS, and it specifically eliminates new construction. That means we are seeing what buyers are currently paying for townhouses and condominiums (green line) as well as single family detached homes (red line). The graph shows that prices are coming down for both, and if interest rates continue to climb, we will see this trend continue. The best way to keep up with the latest news for real estate trends in Tallahassee is to subscribe to our blog (see simple form in right sidebar of the Tallahassee Real Estate Blog). Every time we update the blog with an article, you will receive it by email. So subscribe today to join the thousands of other home sellers, buyers, Realtors, bankers, lawyers, and homeowners who keep current with real estate trends in Tallahassee.